justcallmegertie | "There are 3 types of accountants – those that can count and those that can't"
At 2:30 on Tuesday afternoon we boarded a bus to Vienna from Prague, the last stop of our official Mid Europe trip. I visited Vienna many years ago on an Insight Vacation tour, but it was more of a passing through, so was looking forward to the visit. 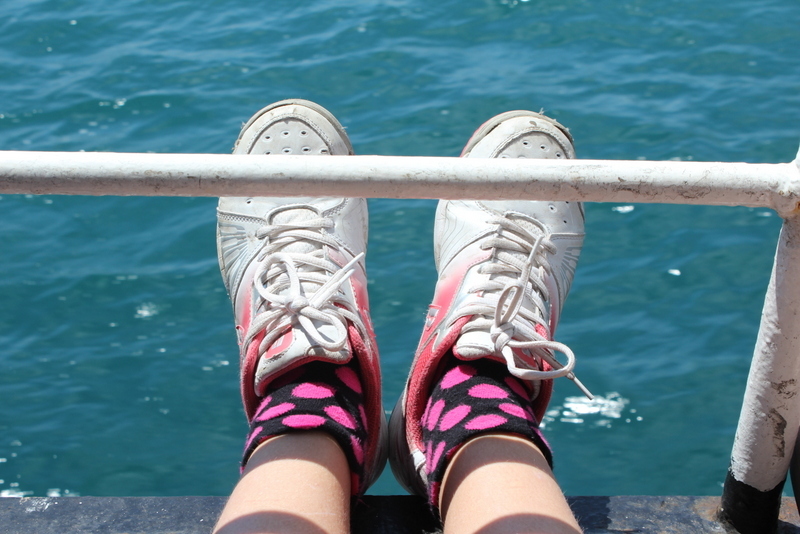 Also, after much walking for many days, I was looking forward to putting my feet up for a few hours! When we arrived in Vienna, it was drizzling and I immediately called an Uber to take us to our hotel. After settling in, connecting to the wifi, we walked down the road to get some dinner. There were a few options, but we decided on the most authentic looking Viennese restaurant, Mimoza, on Siebenbrunnenplatz. The food portions were astonishingly big and extremely reasonably priced (Bianca had a Chicken Cordon-Blue for €6.90 and Anya and I both had Schnitzels for €6.50 each). After dinner we retired to our hotel as we had an early day the next morning. After a delicious buffet breakfast, we set off to find the bus into town. The map provided by the hotel was slightly confusing, and we were not sure where the bus stop was but after spotting a bus with our number on it, and a bit of a sprint to make it to the bus, we arrived at our meeting place in front of the Albertina, for our walking tour with Good Vienna Tours. I booked the tour in advance, even though there was no upfront fee, but rather tip based and I was very glad I did. The group was quite big, so initially I was a bit apprehensive, but Iva, our guide controlled the group very well. She was equipped with an iPad which gave her the opportunity to show some pictures of art and even a couple of movie previews along the way to spice up the tour a bit. Our meeting point was across the street from the Hotel Sacher Wien, and Iva started off by telling us the story of the most famous Viennese culinary specialty, created by Franz Sacher for Prince Wenzel von Metternich in 1832, the Sachertorte. We never managed to go and eat this special chocolate cake at the Hotel Sacher, but I did manage to eat a piece at the airport on the way out, and it really is deserving of its fame! Iva also explained how the standing tickets for the Vienna State Opera works, that’s of course assuming we had the energy to stand in line for a few hours for the chance to get cheap standing tickets to the Opera…which we didn’t. Next, we moved on to the entrance of the Albertina, a large art museum built on the last remnants of the fortifications of Vienna. She showed us a picture of the most famous picture in the Albertina, the Young Hare, a watercolour painting by Albrecht Dürer, dating back to 1502. We proceeded to the Burggarten, behind the Hofburg palace, with its statue of the emperor Franz Joseph and of course the famous Mozart marble statue. Iva spent some time explaining the importance of the Habsburg family in the history of Vienna and contributed some more to the discussion of the Viennese love-hate relationship with Mozart. The Mozart statue or denkmal, is situated on Southwestern end of the Burggarten and has a flower planting area in front of it in the shape of a treble clef (music note). Apparently it is beautiful in summer as the flowers bloom. But apparently much more difficult to take a picture! Our next stop was the Heldenplatz, where Hitler announced the Austrian annexation by Nazi Germany (the Anschluss) on 15 March 1938. The Heldenplatz was commissioned by emperor Franz Joseph as part of the Ringstraße boulevard project. It has been the setting for many historic battles and events in the course of Viennese history. Iva explained many of the historical events that took place and showed another video clip (the name of which escaped me now…). We walked through the entrance of the Hofburg palace past the Imperial Treasure Museum towards the Spanish Riding school, where they still train Lipizzaner horses (tracing back to 800 AD) in the classical dressage methods. Iva highly recommended attending a show of the horses which I’m sure would have been fabulous. As a side note, we have our own Lipizzaner horses, tracing back to the Croatian branch of the Tulipan breed of Lipizzaners in Kyalami in South Africa, where these Spanish horses are still trained in the classical method as well. The South African Lipizzaners were brought to South Africa by Count Jankovich-Besan in 1944 from a war-torn Europe. I saw these horses perform with the Drakensberg Boys’ Choir a number of years ago and it was magnificent! It was great to see where they originate from. Quite impressive is the fact that entrance to most museums in Vienna is free to under 19 year olds. Unfortunately there are so many fantastic museums that we barely scratched the surface! After the Hofburg Palace we stopped at Rosenberger restaurant, a large buffet style underground food hall for the quick coffee to warm up from the cold. On our way to St Stephen’s Cathedral, we walked through the Neuer Markt, which is actually one of the oldest places in Vienna. The elongated square is surrounded by shops, including A. E. Köchert, a jeweler where original diamond hair stars, such as those worn by the much loved empress Sisi, can be bought for a small fortune. The square also hosts the Donnerbrunnen fountain, which didn’t have any water in when we were there but was still very impressive. The naked figures (allegories of the Danube’s tributaries) were removed by the Empress Maria Theresia when she established the Chastity Commission in 1773, but was thankfully restored to their rightful place in 1801. St Stephen’s Cathedral (or Domkirche St Stephan) with its multi coloured roof tiles, is breathtaking. The current Romanesque and Gothic style building dates back to the 14th century but stands on the ruins of two earlier churches. We decided to return at a later stage, as we were told that the view from the roof is magnificent. We also walked past the Mozarthaus, where Mozart lived (in apparent luxury that seems quite a contrast to the poor pauper end of his life) and composed. A short walk took us past Figlmüller, a restaurant famous for the best Wiener Schnitzels in the whole of Vienna at not an unreasonable price of €14.90 (for a schnitzel big enough to feed two people with leftovers…). The restaurant is however very busy, so even though we did try and get in the next day, we were not successful. Finally we walked down Fleischmarkt street and ended our tour at St Rupert’s Church (Ruprechtskirche) an ivy covered old church dating back to the 12th century. At the end of the tour Iva spent a bit of time giving some recommendations for restaurants, and answered some questions. It was certainly a very worthwhile tour and a great way to kick-start our trip to Vienna. After a quick snack, we made our way back to the Albertina museum, as I was very keen to see the Monet to Picasso exhibition. There was also a Ways of Pointillism exhibition on at that time, showcasing the transition of art through Pointillism from George Seurat, Signac and Van Gogh, which I found breathtaking and very informative. We spent a few hours in the museum and eventually had to rest our weary feet! We went for dinner at Reinthaler’s Beisl (another recommendation) and had delicious schnitzels (as you do…) and made our way back to our hotel. The morning started with much excitement. Bianca had applied for au pair work in America, as she decided to take a gap year, before starting varsity. She turned down a potential family just before we started our trip, following her instincts, and I was very proud of her for making such a brave decision, with no other options to fall back onto. And then almost two weeks passed, in which I could see she was stressing about what she would do if she did not receive any further interview requests. So, it was with huge relief that she woke up to an interview request from a family in New Jersey. She sent off a return email but since it was the middle of the night in the States, we would have to be patient. As a bonus, it was a beautiful sunny day, although it was freezing cold outside. We had a tour planned to Schonbrunn palace on the outskirts of Vienna and we were very excited. After breakfast I realised that our tickets were only valid for entrance for a very specific time, and we decided to take an Uber to the palace, saving us the hassle of finding our way to the palace via public transport. We has booked the Grand Tour and spent a good hour plus walking through the imperial rooms of the palace, from the impressive Hall of Ceremonies to the intimate rooms of Maria Theresia, who ruled the Habsburg dynasty for 40 years) for with her many kids and doting husband, the Holy Roman Emperor, Francis I.
I was quite impressed by the number of her 16 children (10 of whom survived into adulthood) went on to become queens and kings and princes in their own rights. She was also the mother of the famous (or infamous) Marie Antoinette of France, who died under the guillotine after the French Revolution. Afterwards we strolled through the beautiful palace gardens, which very much reminded me of Versailles. It was really cold, but it was lovely to experience the bright winter sunshine. We made our way back (on the metro this time around) to the city centre and decided to take the historical Vienna Ring Tram, a 30 minute tram ride around the Vienna Ringstraße with commentary. Of course we had some Käsekrainer or hot dogs with chunks of cheese in the sausages on Stephanplatz before we boarded the Ring Tram! It was delicious. Afterwards we tried to find a restaurant for lunch. As mentioned above, we tried Figlmüller but unfortunately we would have to wait too long for a table. We found an Italian restaurant on Schulerstraße, which looked like the type of place we could sit down, enjoy a glass of wine and a relaxing lunch. And indeed, Ristorante Da Capo was such a place. Unfortunately, it was during lunch that we received notification that our flight to Amsterdam, which was due to leave at 6:55 the next morning, has been cancelled. A quick internet search confirmed that lots of flights to Amsterdam Schiphol had been cancelled and delayed as a result of fog. This did create a bit of a panic but we were told to wait for re-booking information so there was little we could do but wait. The sun was starting to set as we walked to St Stephen’s Cathedral. I wanted to go up to the tower and catch the sunset from there. It was a bit of a squeeze into a tiny lift, but the view from the top was magnificent. The multi coloured roof tiles were even more impressive from close up! Unfortunately, there is a cage-like structure at the top (presumably to protect people from falling off the tower) but this does distract a bit from the view. Afterwards we made our way back to the hotel, to give Bianca a chance to email the family and to try and find out what the plan was with our flight. We had accommodation booked in Amsterdam and I was uncertain whether we would be able to extend our stay at our hotel in Vienna, so it was important to find out if we would still be able to get a flight to Amsterdam the next day. Finally, just after 8:30 in the evening we received confirmation that our flights were re-booked, but only on the 31st of December, which would mean that we would only arrive in Amsterdam in the afternoon of the 31st. Luckily we were able to find a room in our hotel in Vienna. We had to move to a smaller room though but at least that was sorted. And all of the sudden we had an extra day in Vienna, so we decided to have a bit of a sleep in. We had a relaxing morning, went to breakfast a little later, packed and moved rooms. Late morning, we made our way back to the city centre. It was another glorius, sunny day and I gave the girls a choice as to what they would like to go and do. They chose the Natural History Museum, which they were keen on the day before, but we decided it would be too rushed. I googled the museum that morning and realised that we struck gold. On Fridays, Saturdays and Sundays, the NHM arranges a tour to the roof of the museum, and as our luck would have it, there was a tour on this Friday afternoon at 3:00pm. It promised to be an unforgettable experience. Once again, under 19 year olds could enter the museum for free and adult entrance fees were only €10. We did have to pay an extra €8 per person for this extra tour, but it was definitely worth it! The Natural History Museum is housed in one of two identical buildings on either side of the Maria-Theresien-platz. The other building houses the Kunsthistorisches Museum or Museum of Art History. If we had more time I would have been very keen to visit this museum as well. The two museums were commissioned to house the formidable collection of the Habsburgs. The two buildings are exactly the same on the outside, but apparently the interior is different. The NHM opened in 1889 to the public. The museum hosts a very large, very impressive and informative collection. The audio guides were great, the many interactive displays provided entertainment for kids (and adults) of all ages and we just loved it. I could spend a whole blog post talking about everything we saw and learned, but suffice to say that some of the most impressive exhibitions were the Venus of Willendorf exhibition, the history of science exhibition, some of the wonderful gemstones (including the gemstone-and-diamond bouquet of flowers which Maria Theresia had made as a present for her husband), the dinosaur collection and the huge mammal exhibit. And then of course, as part of the rooftop tour, we got to see some areas that are not open to the public, including the 40 000 large human skull collection in the Anthropology department! There were even some decorated and skulls painted with flowers from the Bone House in Hallstatt. And of course, the view from the rooftop was just amazing. We made it up there just as the sun was setting and I would have quite happily spent another half an hour up there taking pictures but alas, it was time to go back down. A fantastic experience all and all. We left the museum when it was already dark, and after a bit of gift shopping near St Stephen’s Cathedral, we started making our way back to the hotel. Bianca had an interview with her potential family at 6:00pm, which went very well and afterwards we went for dinner at another restaurant in the area, Restaurant Maria Rosa. I would be amiss to say that there were not Schnitzels served at our table…and beers. The next day was going to be a busy day, with our flight scheduled to leave at noon, but we went to bed satisfied to have had such an excellent bonus day. We loved out time in Vienna! I did some research before the time, and as it is, the main Christmas celebration takes place on Christmas Eve, as most Czech people stay at home (read most restaurants and shops are closed) and have a traditional Czech Christmas dinner with the family. Apparently, in the days leading up to Christmas, the markets sell live carp everywhere which will be taken home to cook up a storm for Christmas dinner. I was happy to have stumbled across this little tidbit of information, and decided that when in Rome, do as the Romans, so we had a booking for a traditional Christmas dinner at a restaurant in Prague Nove Mesto (New Town). We arrived at the Praha-Libeň railway station after 3:00pm in the afternoon and it was immediately clear that the city was empty. A lonesome man at a ticket counter grumpily pointed us in the direction of the automatů to purchase tickets for the tram. Luckily, the tram ride was a short one and we arrived at the Luxury Family Hotel Bílá Labuť soon after with a bit of time to kill before we had to leave for dinner. Another tram ride brought us to the Nove Mesto, where we had a short walk to the medieval Restaurace u Českých pánů, where we had a booking for dinner. The restaurant is set in Gothic cellars, restored to offer the feel of medieval times, and we booked for a traditional Czech Christmas dinner. The ambiance was pleasant, with live music and an explanation of the food on offer, with little extras to assist in mimicking a traditional Czech Christmas dinner. We were welcomed with a complimentary drink of Becherovka, a herbal liquer, or a glass of Prosecco. Starters were Old Czech mushroom Cuba, a sort of barley risotto and was very delicious, followed by a creamy fish soup (made from carp, of course). The main course was breaded veal cutlet (don’t let the ‘let’ in cutlet fool you, it was a monster portion…) with homemade potato salad. Apparently, potato salad is also a very traditional addition to the Christmas dinner. Dessert was an apple strudel with ice cream, followed by coffee or tea and Christmas cookies. All this in a medieval cellar setting with Christmas music played by traditional folk musicians. All and all, the food was good, and we dutifully followed the instructions for the Czech traditions, including coring an apple. If the inside of the apple is shaped as a star, it means that everyone will get together the next year in happiness and health. A four-pointed cross is a bad omen and means that someone at the table will fall ill or die within a year. In addition, we each had to crack a walnut by hand, and if it breaks clean, with the insides pretty much intact, it is meant to be a positive omen. The only downside and disappointment was that the service was shoddy to say the least. After the starter drink the waiter never once came to ask if we wanted to order anything else… dishes were brought out in rapid succession, but not once did he stop and ask for further drinks orders. Our coffee was ordered from the manager who happened to clear a table next to us. We spent almost half an hour jokingly trying to get the waiters attention to get our bill, imagining there was an invisible wall around our table (with much amusement from fellow diners). Before heading back to our hotel, we walked down to the Wenceslas Square, a traditional setting for demonstrations and surrounded by shops and the business district. It was more a very large boulevard than a square, but the lights were pretty and it was a nice round off to a pleasant evening. We woke up on Christmas morning ready to explore the city. After a great breakfast, we set off towards the Old Town or Staré Město where we were to meet our guide for another walking tour. There was light rain forecast and we were not sure what would be open on Christmas day, but that didn’t put us off. We moved on to the old town square, which was starting to show signs of live as the Christmas market was starting up for the day. The huge Christmas tree on the square also features a small show of lights in the evenings (although we didn’t ever see this). We walked across the square to the statue of Jan Hus, a religious reformer who was burnt at the stake for his beliefs. Following one of the exits from the square, we walked to the Tyn Courtyard, founded in the 12th century where merchants came to pay customs for their goods. The courtyard features the Granovsky Palace, a Renaissance palace with the walls decorated in sgraffitoes and wall paintings. Unfortunately many of the paintings are faded badly, and in need of restoration. We stopped briefly at St Jacob’s church or the Basilica of St James, where we were able to view the inside of the church through a one way window. Jana shared the story of the mummified arm which, according to legend, belongs to a thief who tried to steal from the bejeweled altar when the statue of the Virgin Mary came alive and grabbed his arm, where he was found in the morning. His arm had to be amputated to rescue him and the arm was put on display in the church as a grim warning. Moments later the grumpy priest slammed open the door of the church and Jana sneered at him. Clearly not a lot of love lost there! We made our way past the Grevin Praha, or the Madame Tussaud’s of Prague, which was closed for the day, to the House of the Black Madonna, a Cubist building that houses the Cafe Orient, which according to Jana served delicious cakes and sandwiches. We did peek into the building to see the awesome staircase, which is apparently often missed. Next, we made our way to Municipal House, next to the impressive Powder Gate, one of the original 13 gates of Prague. The Municipal House is a civic building that houses the Smetana Hall, a concert venue, where classic music concerts are held daily. The residents of Prague claim to have first discovered a young Mozart after his opera The Marriage of Figaro was performed there with tremendous success. The next year, Mozart visited himself and apparently he “counted this day as one of the happiest of his life”. His opera Don Giovanni debuted in Prague later that year to very appreciative audiences. Apparently Mozart famously said “Meine Prager verstehen mich” (My Praguers understand me). Jana told us the story of Mozart with some scorn and highlighted the fact that the Viennese today does not know where Mozart is buried as he died very poor and was buried in a mass grave. After this we moved to the other side of the Old Town square to the Jewish Quarter or Josefov and the impressive Spanish Synagogue, with the bizarre Franz Kafka statue next to it. The statue is inspired by the short story written by Kafka called “Popis Jednoho Zápasu” (Description of a Match). By now it was raining but we managed to get a peek at the Old New Synagogue, the Jewish Ceremonial Hall and the Maisel Synagogue. Jana also shared the story of the legend of the monster Golem, in the 16th century by the Rabbi Loew, to defend the ghetto from antisemitic attacks. The monster was created from clay from the banks of the Vltava river, and brought to life through Hebrew incantations. The rabbi deactivated the Golem every Friday night by removing the shem, but legend has it that one Friday he forgot, and some reason the Golem went on a rampage. The rabbi finally caught up with him and removed the shem and he fell to pieces. Legend has it that the body of the Golem was stored in the attic of the Old New Synagogue and still lies there today. This concluded our walking tour and we were happy to make our way to a small little restaurant, Paneria, on Jana’s recommendation to warm up and dry out a bit. After lunch we made our way to the Klementinum, a historical complex of buildings which once housed one of the largest Jesuit colleges in the world. And of course, it houses one of the most impressive libraries in the world, the Baroque library hall, which I was dying to see. We booked a tour and was not disappointed with the library (which we unfortunately was not allowed to photograph), but the building also contained an observatory with wonderful equipment. And finally, the view from the tower was definitely worth the claustrophobic climb to the top. After the visit to the Klementinum, we started making our way back to the hotel as we had a boat cruise on the Vltava river planned for the evening. I originally wanted to book the Jazz Boat, but by the time I came around to making a booking, the seats were all booked out. So we settled on another boat cruise with a buffet style dinner and live music, through Viator. The cruise was pleasant and the food was reasonable and in the end we had a fun evening. We made turns to brave the cold to go up to the deck for pictures as it was difficult to see anything from insude the boat. After dinner, we went back to the hotel to recharge our batteries overnight! After a very busy Christmas day, I relented and we had a bit of a sleep in the next morning. We wanted to visit the Castle district and the Charles bridge on our last full day in Prague. We initially thought we would join Jana again on a visit to the Castle district in the afternoon, but I wanted to go and visit the castle itself, so we decided to do it on our own steam. After a short tram ride, we made it to the other side of the river, and made it in time for the ceremonial changing of the guards at noon. The queues at the castle were horrific. I can only imagine how busy it must be in summer. We had to queue at every entrance and the crowds were crazy. In the end, it made the whole experience of the castle very tiring, but it was still worth it. There are various tickets giving you entrance to certain sections of the castle. We bought tickets that gave us access to St Vitus Cathedral, Old Royal Palace, St. George’s Basilica and the Golden Lane with Daliborka Tower which was as much as i thought our tiresome feet could withstand. St Vitus Cathedral was very impressive, once we managed to get inside (another half an hour queue). Construction on the Gothic Cathedral started in the 14th century, but construction was halted in 1419 because of the Hussite wars and remained uncompleted for centuries. Only in the late 19th century was construction resumed and repairs to the original section undertaken. The cathedral was completed in Neo-Gothic style and solemnly consecrated only in 1929. St Wenceslas chapel is next to St Vitus chapel and is meant to be a cult center for St Vitus. The value of the decorations of St Wenceslas Chapel is incalculable. The lower parts of the walls are decorated with more than 1300 gems, made in Bohemia. The joints between them are covered with gold. St George’s Basilica was originally meant to be a second church for Prague castle in the 10th century. The current Romanesque appearance of the church dates back to the time of the reconstruction carried out in the 12th century. The interior of the basilica is austere and monumental. There are tombs and skeletons visible, one of whom apparently belongs to Prince Vratislav, father of St. Wenceslas. The origins of Old Royal Palace dates back to the 9th and 10th century. 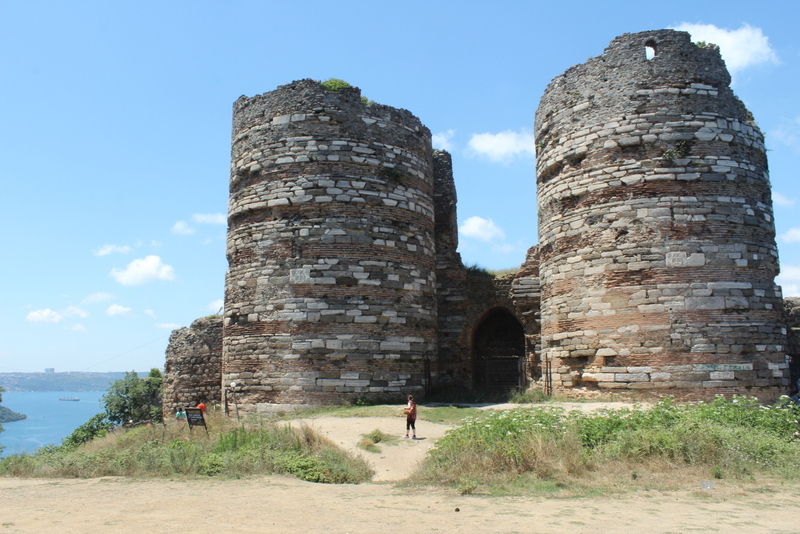 In the 12th century it was replaced with a stone castle, remains of which is still preserved. In the 14th century, the king and emperor Charles IV enlarged the Romanesque building and so a Gothic palace with a vaulted interior for state purposes and a band of arcades on its northern side came to be. After a period of 80 years where the castle was empty, the King Vladislav Jagiello commenced a large scale reconstruction, adding the magnificent Vladislav Hall. Our last stop of the Prague Castle was the Golden Lane. The modest dwelling, in small scale architecture, were inhabited by defenders of the Castle, servants or for example goldsmiths and the Castle marksmen. The tiny houses were occupied until World War II, but already during the period of the First Republic, care was taken to ensure that the picturesque character of the Lane was not changed in the course of modifications. From 1916 to 1917 house No. 22 was inhabited by the writer Franz Kafka. After the castle visit, we walked down towards the river, sharing a traditional trdelnik covered with chocolate. You can buy trdelnik everywhere in Prague and they resemble the Kürtőskalács or chimney cake we had in Budapest. The cake is rolled around a wooden stick and then grilled and topped with sugar and walnut mix. Decadent and delicious! Something I would love to try at home. We strolled back over the magnificent Charles bridge as the sun was setting and despite my feet being so tired, that I could not stand still, I could not get enough of the bridge! Afterwards, we took a short walk to Restaurace Sedm Konšelů, another one of Jana’s recommendations. where I had the tradiční českou svíčkovou, which is fillet of beef in cream sauce and cranberries, served with traditional bread dumplings. It was good, and I ate the cranberries like Jana directed, a little bit at a time with the sauce. After this late lunch, early dinner, we returned to the hotel, as we had tickets for the ballet at the National Theatre that evening! Knowing how much Bianca loves the ballet, I thought it would be a real treat to go and see the Nutcracker in the National Theatre, which dates back to the 19th century. Unfortunately I didn’t realise that it was a modern day adaption of the Nutcracker and actually had very little resemblance to the original ballet, other than the music, but it was still a fun evening out! The theatre is magnificent and it was a real treat to see a show there. This was our last morning in Prague, and we decided to go and do some shopping. Bianca’s suitcase broke when we arrived in Prague, and we needed to get something else. We also wanted to get some souvenirs and gifts. After some shopping, including the cutest Bohemian glasses, we returned to the Old Town Square to view the hourly show of the Astronomical clock, which we have missed until then. It was extremely busy, with people shoving and pushing, but it was worth it. Afterwards, we did a final visit to the Old Town Square, a last Trdelnik and a couple of last pictures before we headed back to the hotel. I absolutely loved Prague. The crowds were quite something and I really wished I could have had at least one sunny day for some nicer pictures, which will give me an excuse to return again one day in summer! Finally, at 2:30pm, we boarded the bus for the semi last leg of our trip, to Vienna. I was glad to put my feet up but sad to leave this beautiful city behind. Our overnight Lux Express bus from Budapest to Kraków, Poland departed at midnight and by the time we got onto the bus we were exhausted, as we got up early the previous day to make it to the Szechenyi baths. The bus was luxurious though and we had a 6 and a half hour drive, so we all dozed off quickly. Unfortunately, I am not a good sleeper at the best of times, so when we arrived half an hour early in Kraków, I knew that it was going to be a long day! After our disaster with the taxis in Budapest, I tried very hard to figure out the public transport system at the bus station but with little luck, and mainly because everything was in Polish. Eventually we decided to just bite the bullet and take a taxi to our hotel, but this time I did ask how much it would be upfront (there is a good tip for you whenever you travel overseas…) and the quick conversion to South African Rands in my head confirmed that it was quite reasonable (about R100). We arrived at the hotel around 7:00am and were very relieved when we were informed after breakfast that our room was available for an early check in! A quick shower and power-nap was in order before our 9:30 departure for our tour to Auschwitz. Kraków is the second largest city in Poland, and for many centuries, was the capital of the Crown of the Kingdom of Poland. In the second world war, after Germany invaded Poland, Kraków became the headquarters of the Nazi General Government. This is also the city where Oscar Schindler established his enamelware plant, utilising low cost labour from the Jewish ghettos, which eventually ended up becoming one of the largest rescue initiatives for many Jews in the second world war. And of course Auschwitz was the largest concentration camp in Europe and was the guinea-pig site for gas chamber exterminations by the Nazis in WWII. Auschwitz II-Birkenau went on to become the major site of the Nazi Final Solution to the Jewish question. The town of Oświęcim is situated about 50km west of Kraków. Auschwitz was the German name for the town and this is where the German Nazi built first Auschwitz I (initially for Polish prisoners) and later expanded to the much larger and more ‘factory like’ Auschwitz II-Birkenau. The tour was a chilling experience, but very informative and very thought provoking. I learnt so much, but I think the one thing that really captured me was that most of the Jewish prisoners were executed on arrival, so most of the prisoners were actually Polish people, Romani people (gypsies), with many intellectuals, homosexuals, etc being incarcerated in the camps. Many died within days and weeks of arrival due to disease, torture and hardship. This was also the site of many medical experiments, including sterilization experiments on women. And the infamous experiments on identical twins by Josef Mengele also took place here. There are rooms full of glasses, suitcases, brushes and other personal belongings from Jews that the Russians found there when the camp was liberated. After the tour we returned to Kraków in a somber mode. It was already after 4:00pm when we returned to the hotel and decided on an early night dinner at the popular local restaurant Pod Wawelem, which was just next to our hotel. Anya went for the ‘Huge Schnitzel served with chips’ (very traditional Polish, I know…) and let us just say the portions were huge! And the prices were really cheap too. Tummies full, we decided to have a well deserved early evening at the hotel. After a filling breakfast at the hotel, we set off towards the Main Square of the Old Town, to meet up with a walking tour departing from St Mary’s Basilica. It was cold outside and we had time to go for a quick coffee before the start of the tour. We did our walking tour of the Old City Center with Ela from Cracow Free Tours and she was really excellent. Her knowledge of the city, its history and the legends were fantastic. She gave us lots of tips for places to eat, to shop and to visit. We started the tour by walking to the green park that encircles the Stare Miasto, Planty Park, where the Medieval city walls used to stand until the early 19th century. Our first stop was the Juliusz Słowacki Theatre on the border of Planty Park, erected in 1893 on the spot of a 14th century church and monastery of the Order of the Holy Ghost. From there we moved to the Kraków Barbican, a fortified outpost which was once connected to the city walls and walked through the 13th century St Florian’s Gate, which, we were told, follows the footsteps of visitors in the medieval ages into the city. From St Florian’s Gate, we walked down the Florianski street towards St Mary’s Basilica. The street is one of the most prestigious in Poland, evident from the many boutique stores down the street. Apparently apartment rentals in the street ranks the 2nd highest in Poland. Our walk down Florianski street coincided with the top of the hour and we witnessed the St Mary’s Trumpet call, a traditional five note Polish anthem that is played every hour by a trumpeter in the tower of St Mary’s four times in succession from the 4 different windows of the tower. Ela shared the legend of the Trumpeter of Kraków, who according to legend warned the city dwellers of the invasion of the Tartars in the 14th century and was killed by an arrow before he could finish the anthem. In honour of the sentry who gave his life to safe the city. legend goes that the anthem is still played until the note where he was killed, which is the reason why the anthem sounds incomplete. Apparently the legend is not true and was immortalised in a children’s book by a professor on a scholar exchange at the Jagiellonian University in 1928. We moved on to the Main Town Square, which hosted the annual Christmas Fair. The Square, at 4000 m² is the largest medieval square in Europe. Walking through the Cloth Hall, the western side of the square (sans the Christmas market) gave a better feel for the size and importance of the market. Ela was also outspoken about the ‘Eros Bandota’ sculpture on the Main Square, which was gifted to the city by the Polish artist Igor Mitoraj. The sculpture is a large empty head of a man in bandages on its side. A walk through the university parks took us to the St Paul II window in Kraków at the Bishop’s Palace, where the Cardinal Karol Wojtyla were a resident for 20 years before he became Pope John Paul II, where he often made evening appearances as Pope when he visited Kraków in later years. We continued our walk South towards the Wawel Castle past the Franciscan Church, St Peter and Paul’s church and the oldest church in Kraków, built in the 11th century. A short walk down Kanonicza street (the oldest street in Kraków) brought us to the Wawel Royal Castle, the 14th century castle that was the residence of Polish Kings for centuries. The castle was occupied in the Second World war and they built a new administration building on the hill. After a short walk around, with lots of informative stories about the castle (including the one about the Nazi governor Hans Frank’s wife who made ‘ugly’ alterations to make the castle more ‘livable’), we finished the tour. All and all an excellent tour! We made our way back to the hotel (which was across the road from the castle) for a short break and returned back to the Castle in the afternoon. We visited the Wawel Cathedral and some of the rooms in the Wawel Castle, with its splendour and wonderful artifacts, paintings, tapestries and furniture. Late afternoon, we made our way to the Main Town Square again for a late afternoon lunch at one of the many restaurants around the square, Kawiarna Bankowa, where I had a traditional Polish bigos, or a hunters’ stew with finely chopped meat, sauerkraut and shredded cabbage. And mulled wine, of course! The girls had goulash. The food was delicious and filling after a full day of walking around. In the early evening, we split up to do some last minute Christmas shopping and I went to see St Mary’s Basilica which was quite spectacular inside. We later met for coffee (and another hot wine) and started making our way back to the hotel. One final stop was the monument on the banks of the Vistula River (just below the Wawel Castle), dedicated to the mythical Wawel dragon. Legend goes that the dragon lived on the banks of the river and fed on lambs and young girls. Because King Krakus has a young daughter and was terrified for her safety, he promised her hand in marriage to anyone who could defeat the dragon. Endless unsuccessful efforts later a young cobbler takes up the challenge, stuff a lamb with sulpher and lures the dragon to eat it. Later the dragon gets so thirsty that he drinks so much water from the river that he explodes. And the young cobbler and the King’s daughter lived happily ever after. Anyway, there is a statue of a dragon on the banks of the river, and he breaths fire every few minutes. Bianca, earlier in the evening, got lost on her way to the hotel and walked by it by accident so Anya and I was on a mission. And it was fabulous! I took a short video on my phone and hope it captures some of the magic! We would have liked to go to Oscar Schindler’s factory in Kraków but we had an early train the next day to Prague so we decided not to turn in too late. What a beautiful city this was, and definitely worth the detour from Budapest to Prague! I would like to see more of Poland, Slovakia and some of the former Eastern Block countries one day again, as this visit has only wet my appetite! Travelling from sunny South Africa, in the midst of summer to Central East Europe in December is not for the faint hearted. Our departure was at midnight on the 18th of December and we had quite a long commute, via Amsterdam and Vienna, finally taking a train from Vienna to Budapest. As usual, despite our best efforts, we were not travelling ‘lightly’, so looking at our suitcases, I knew it was going to be a bit challenging moving from place to place with suitcases, jackets, but we were off and that was all that mattered! We arrived in Amsterdam Schiphol airport tired, after our overnight flight, but with time to spare before our connecting flight. We had something small to eat at the airport and perused the shops, making mental lists of what we wanted to buy at duty-free on the way back…alas, that never happened, but that is a story for another day. Anya did get a pair of gloves (we never wear gloves in South Africa, like in never). We arrived in Vienna and hastily made our way to the train station for the train to Budapest. We finally arrived in Budapest after 8:00pm on the Monday evening and was immediately met by a bunch of taxi drivers at the train station, offering lifts. The plan was to take public transport to our hotel, but we were tired, with heavy luggage and I decided to just go with the taxi. And in so doing, fell into the number 1 tourist trap (according to our walking tour guide the next day), which is taxi’s. The number 2 and 3 tourist traps in Budapest are taxi’s and taxi’s too….in case you were wondering. We woke up to a cold and foggy morning, but energetic and looking forward to the day. I found a popular breakfast spot in the Pest side, close to the Vörösmarty Square, but being a popular spot, it looked very full and we didn’t have much time, so we decided to go to a little cafe on the corner, Cafe Hilda. Breakfast was fresh and inexpensive and we were even treated with these little complimentary Christmas rolls filled with walnuts and poppy seeds. I think they are called Beigli. With our tummies filled, we were ready for the walking tour. We went with Free Walking Tours, a local company, claiming to do the original walking tour in Budapest. The concept of a free walking tour is fantastic, as you normally get a local guide and as they are not being paid upfront, they are paid with tips, so they have a lot of incentive to do an excellent job. Our guide, Andrais was fantastic. He not only gave us a lot of information about the history, and local culture but also gave lots of tips on food, drinks to try and places to visit. After the tour we were given a little flyer with more information on food, restaurants, eateries and other local information. The walking tour started in the Pest side of Budapest (on the eastern side of the Danube river) and continued to the Buda side, walking over the Chain Bridge, where we walked up the Castle hill to the Buda Castle. We strolled around at the top of the hill, seeing the Sándor Palace (or the White House), the beautiful Matthias Church with its ornate roof tiles and ended off with a glass of mulled wine a the Fisherman’s Bastion. Afterwards, we took a slow stroll back to our apartment in the Pest side, taking in the local scenery in, doing some shopping at a local vintage shop and browsing through interesting shops. Lunch was fresh bread rolls, ham and cheese from the supermarket around the corner. Later in the afternoon, we set off in the direction of Vörösmarty Square again where the biggest Christmas market in Budapest was located. The atmosphere was very festive, with live music and the smell of pastry, mulled wine and meat in the air. 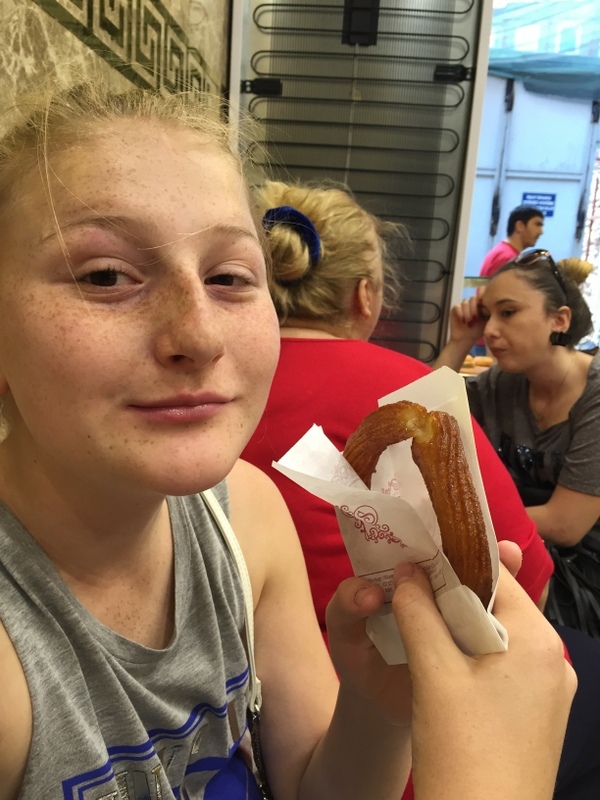 We were craving the local ‘chimney cakes’ or kürtőskalács, and decided to share one. We did some shopping and Anya found a wooden cut-out magnet with her name on it. Very impressed, she told the shopkeeper that it is her name, spelled correctly, after which he informed her that anya is the word for mother in Hungarian! Who would have known? This coincidence was enough to convince her to buy the magnet! After a dinner of hungarian goulash, which came with complimentary Rákóczi Túrós, a sort of ricotta cheese cake traditionally served at Christmas, we decided to take a walk towards the river to see the lights. The Castle at night was absolutely beautiful and we were very lucky to see one of the trams that was decorated in Christmas lights as well. The plan for this day included a visit to Szechenyi baths, a mineral bath close to Heroes’ square in Budapest. 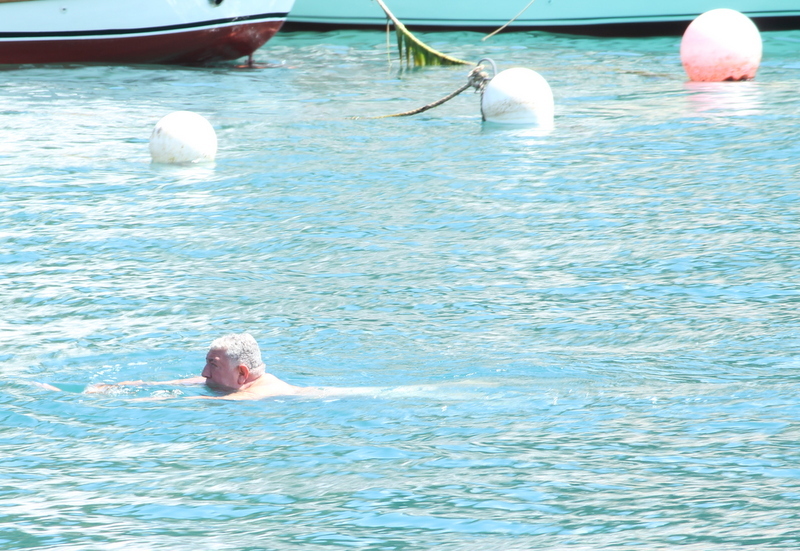 The guide for the walking tour recommended going early when visiting the baths, so avoid the crowds, so we got out of bed early, armed with our swimming costumes and towels in sub zero temperatures! We could only enter the baths at 9:00am, but took a walk around the area (in light snow), taking a walk to the Heroes’ Square before our entrance. It may sounds a bit crazy, but the baths were a great idea, and definitely something different to experience! We couldn’t stay too long as we had to check out of our apartment, but we thoroughly enjoyed the visit. After sort of drying, we went back to our apartment, checked out, left our luggage and went out again. After a light snack and hot chocolate at the Christmas market on Városháza park, we walked to St Stephen’s Basilica where we bought tickets to go up the tower. The view from the top of the tower was amazing! You can walk right around the tower and have an awesome 360 degree view over the city. Afterwards we had a look in the Basilica which was also very impressive with its domed ceiling. After our visit to the Basilica, we needed to rest our feet and stopped for coffee at Avenue Cafe, close to our apartment. I wanted to see the largest Jewish Synagogue in Budapest, the Dohány Street Synagogue, but unfortunately it was closed when we arrived, so we walked around the outside. The synagogue is the largest and Europe and the fourth largest in the world. We walked to the most famous ruin pub in Budapest, the Szimpla Kert in the Jewish district, with very interesting decor but not much to offer in terms of dinner, so we took a long route back to a restaurant close to our accommodation again, which served delicious Italian food, the Panificio Il Basilico. Finally it was time to collect our luggage and make the trek towards the station (via public transport this time!) as we had an overnight bus to Krakow. We loved our short stay in Budapest, and I would love to go back again one day, hopefully in summer. I googled all these magnificent spots to take sunrise pictures, but alas we were not to see the sun on the days we were there, We did, however have some light snow, which ended up being the most snow we had on our trip…. So, as a final picture for this post, herewith our almost snow selfie! I know that you probably thought I’m forever lost to the blogging world, and in all honesty, I almost didn’t start this post. But ta-daa…here I am. In December last year, after 22 years in Joburg, we moved to Pretoria. I grew up (for the most part) in Pretoria and studied here, but moved south when I got married. It has been a pleasant re-acquaintance, although I do feel like a stranger here. I have lost touch with friends from the Jacaranda City, but have marvelled at the beauty of this city, it’s lovely trees and gourmet hideaways. But the main reason for moving here has also been a highlight. After 2 years of hostel living, Bianca was able to stay at home this year. I forgot how I missed our dining table laughs until you cry and cooking for more than 2 people. And I ended up cooking for 3 girls, after a friend of Bianca started boarding with us. Which brings me to the next significant event this year. Bianca finished school. She turned 18 in May, aced her drivers licence, and finished school. If all goes well, she will be off to America next year for a gap year as an au pair. And…Anya started high school at one of the most tradition-rich schools in Gauteng, Pretoria High School for Girls. But even this came with challenges as the school faced critisism from within of its hair policies and for a week in September the school and alleged racial practices were trending on social media. All in all it has been an interesting journey and if anything, has made me realise that my girls are fiercely against any sort of racism. The school is well on its way to recovery and I think will come out of this stronger and more united. There were no overseas trips this year (yet), although we did do a lovely family road trip to the Eastern Cape and I’ve been meaning to still write a post about our Haga Haga visit, listing the top Things to do in Haga Haga, but alas I never got there. In all likelihood it could have been our last road trip together as a family, and I will treasure the memory. And we do have a fabulous trip planned for the next 2 weeks, starting with an around the clock commuting trip this evening at the strike of midnight. We are off to Budapest, Krakow, Prague, Vienna and Amsterdam, with an action packed itinerary and lots of winter woollies, ready to brave the cold for beautiful memories! So, I will see you in the new year and hope to have lots of wonderful memories to share! I hope 2016 has treated you well and all the best for the new year! In recent months Facebook started the ‘Share your memories’ initiative. And for now, I am loving it. Admittedly, in those earlier Facebook years the posts were a bit fewer and further in between, but still every now and then there is a beauty. And so it comes that I was reminded of another precious Anya story. The story of Doodlez, the goldfish. 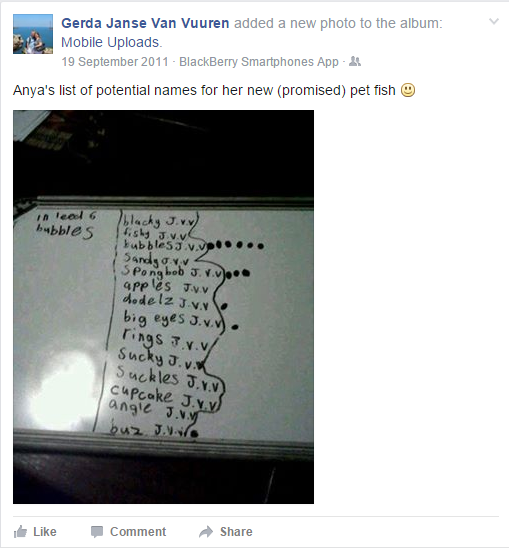 In 2011, my friend Annie promised Anya (then 9 years old) a goldfish. I cannot remember if it was meant to be a belated birthday gift or just because she felt like treating Anya, but in September 2011, we started making plans to get together to purchase this goldfish. By the way, Anya is tenacious when it comes to promises, and will remember and remind you constantly. So, a warning…don’t ever promise her something that you don’t intend following through on! 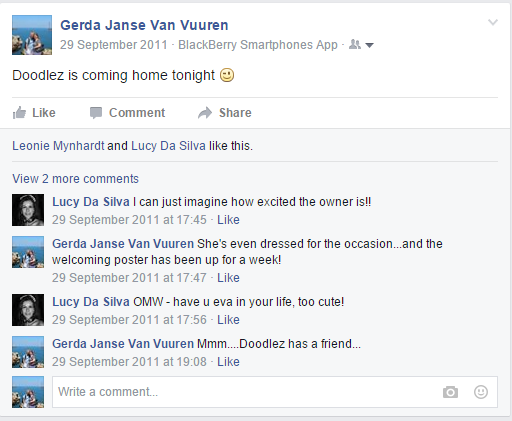 I wish I took pictures of the poster she made to welcome Doodlez in our family, or the fishbowl that we assembled. Special water had to be purchased, the fish had to be floated in a plastic bag inside the fish bowl for hours to acclimatise them to the water. And special oxygen tablets had to be chucked in the water to ensure that the poor fish don’t die of a lack of oxygen. In the end, they decided to buy two fish and the second one was named Bubbles. I kid you not! 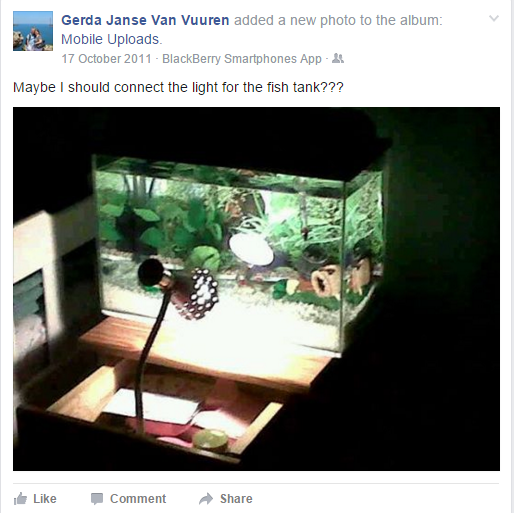 I found her sitting by the fish bowl, reading The Soul Bird from Michal Snunit to the fish. I bought the book for Anya when I was going through a divorce 4 years before and it is a beautiful little book about the soul that lives inside all of us and how the soul files all our innermost secrets in little drawers, where we can draw on its strength and sorrow, with the message that we shouldn’t forget to sit still from time to time and make sure we don’t lose touch with our souls. The most educated and enlightened fish in the world! A proper burial was arranged and Anya even roped in some of the kids from the complex to ensure that it was done properly. They were dutifully laid to rest in the back of the garden. But…that was not the end of the story. 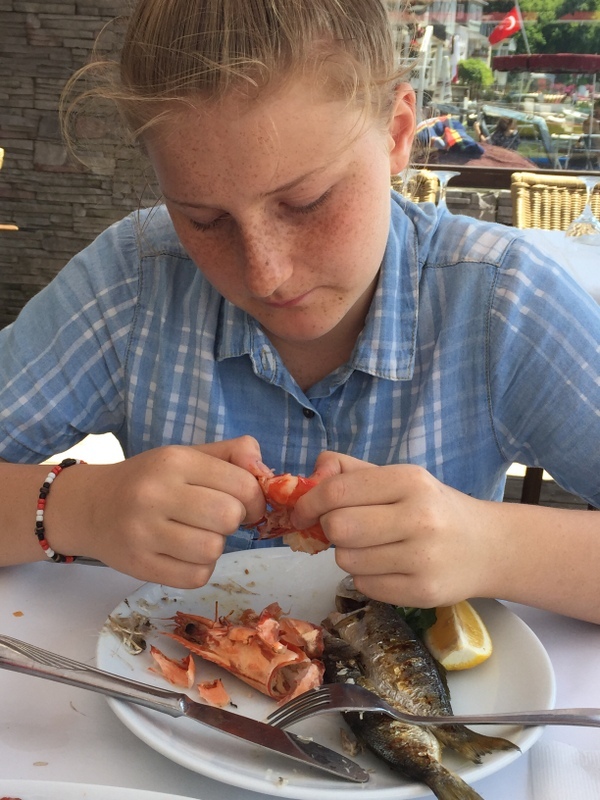 By now, Anya was totally fixated by fish and were adamant that she can do this better…the next time around. 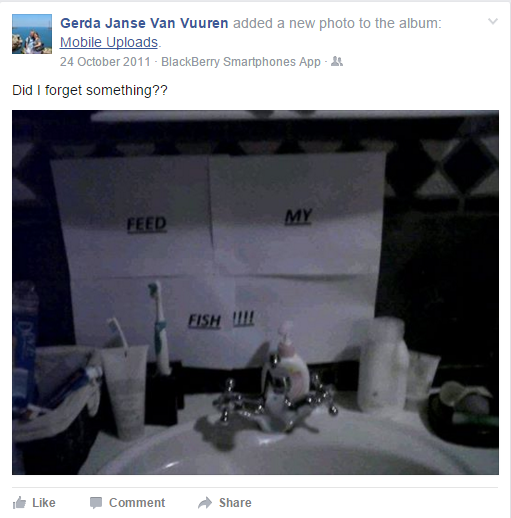 She was clearly paranoid that I was going to forget to feed the fish, so to ensure that I don’t forget, she posted this poster in my room, at my basin, where I brush my teeth and wash my face, so there was no chance I was going to forget! But for a while there, Anya was utterly focused on ensuring some goldfish survive and I am so glad Facebook reminded me of this little episode that made me smile in a time that was clouded by many tough choices and an emotional roller coaster. And, Bianca just told me that her little half brother just got a fish and that she thinks we should donate the fish tank to him. I wonder of the souls of Doodlez and Bubbles will make another child happy! The first thing I did this morning was check my swollen feet…all the walking on cobble streets, up and down hills, took its toll on me the previous day. But icing and some anti-inflammatories seem to have had the desired effect. 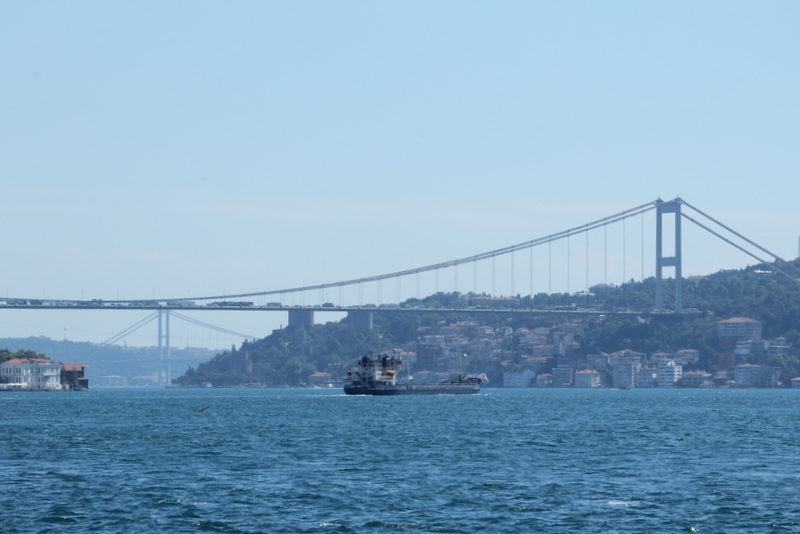 And we had a bit of a different day planned…a Bosphorus cruise. 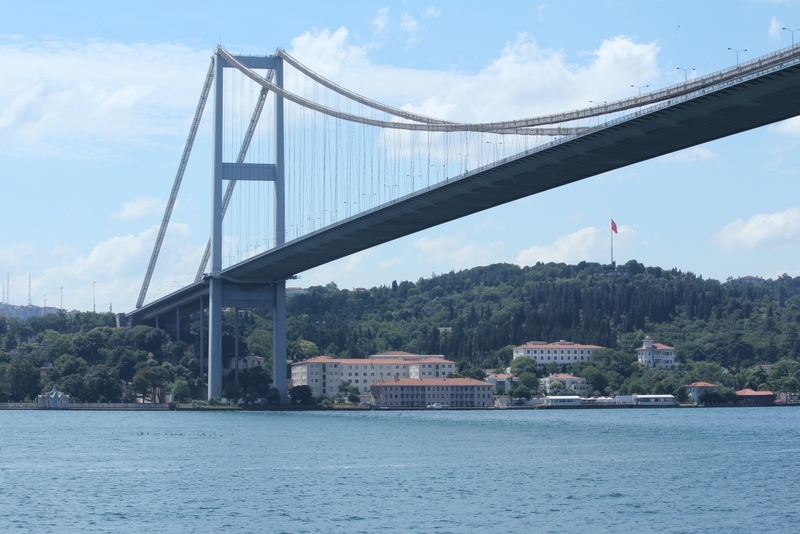 The Bosphorus is the strait that connects the Black Sea and the Sea of Marmara in Istanbul and it separates the Asian and European continents. 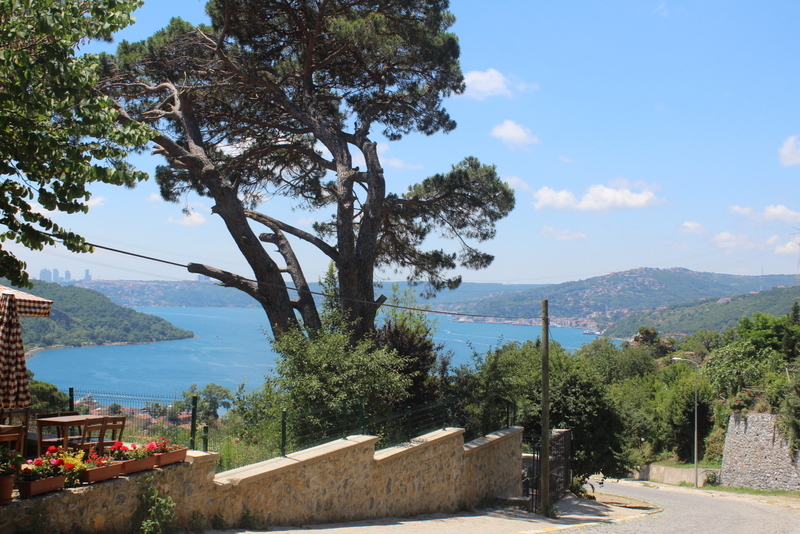 Ideally, if we had more time in Istanbul, we would have loved to make a trip inland. 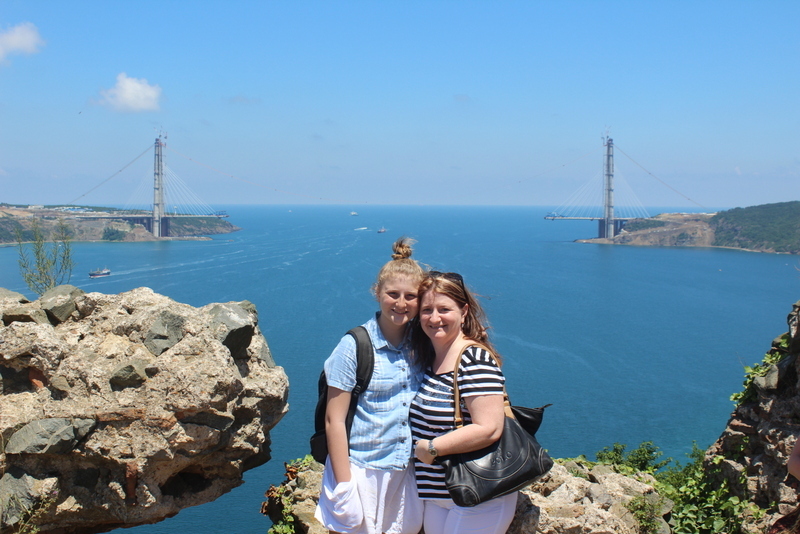 There is so much to see in Turkey, but alas we didn’t have the time. 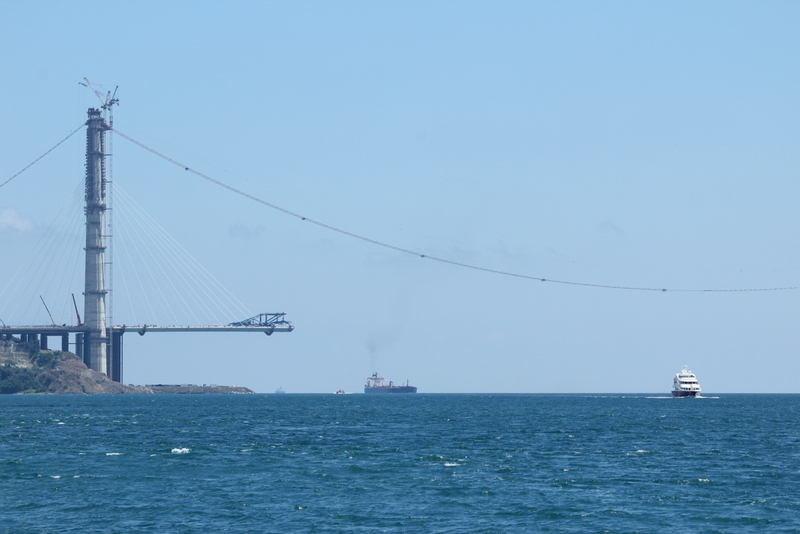 But we were definitely going to do a cruise on the Bosphorus! We needed a little bit more of a relaxing day after two extremely busy days and decided to take the Şehir Hatları cruise, the official ferry company. 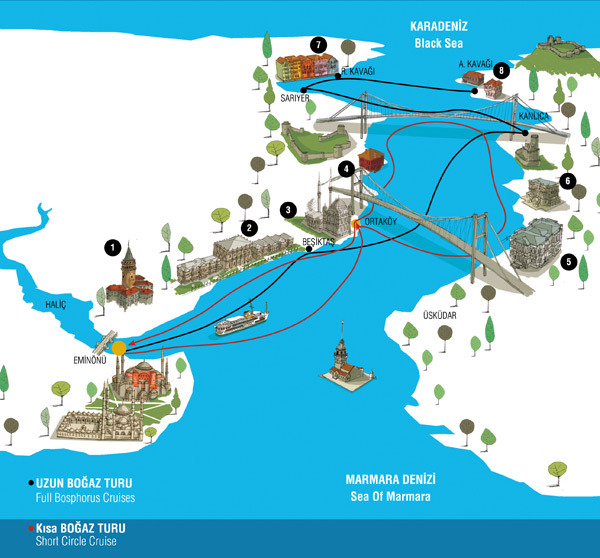 They offer several Bosphorus cruises, and we chose the full Bosphorus cruise, which takes an hour and 45 minutes, to its final stop in Anadolu Kavaği, the last port before the Black Sea. 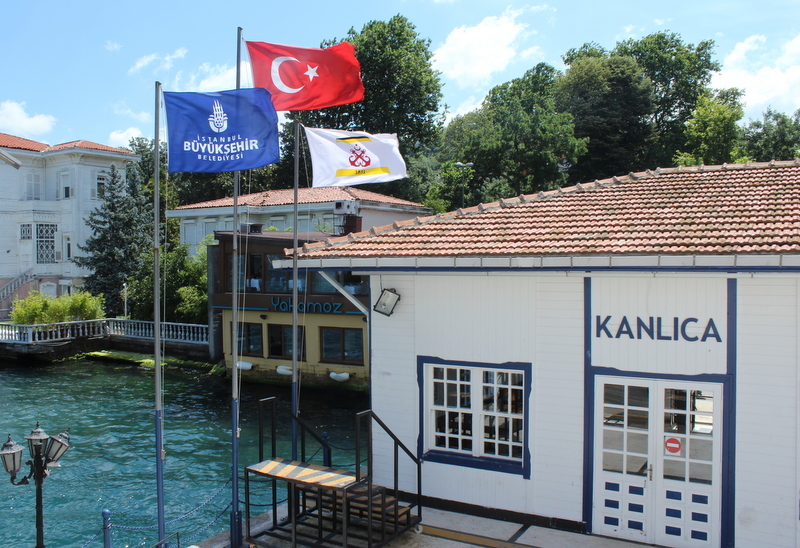 If we left at 10:35am, we would arrive in Anadolu Kavaği just after 12:00pm, which would give us sufficient time to have a look about and have some lunch, before the return journey at 15:00pm. And we would be back in Istanbul in time to still do something else. Perfect! We left the apartment and stopped for a traditional Turkish breakfast at Istanbul Travel Café, en route from our accommodation to the tram station. 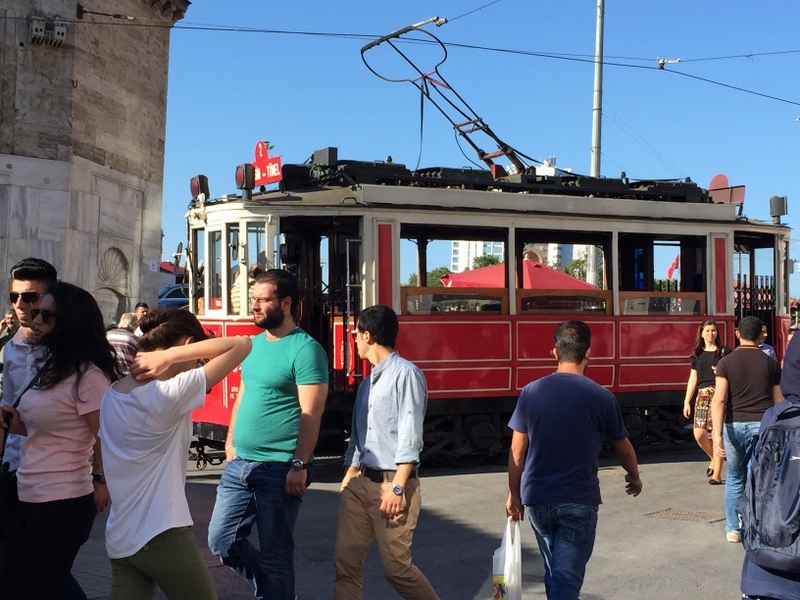 We took the tram to the Eminönü harbour and bought a return ticket for TL25. We also decided to rent guided tour headsets and settled inside the ferry. 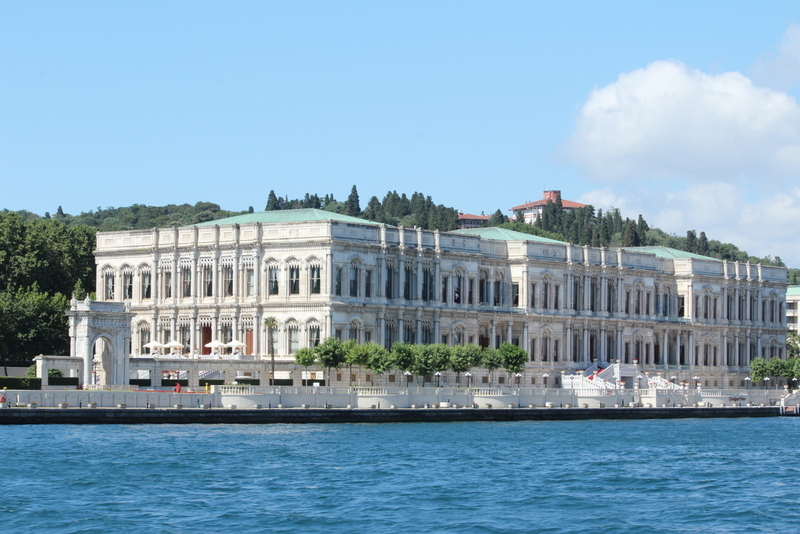 The guided tour was interesting and came with a booklet and gave lots of information about the many large homes and palaces (yalı) on the banks of the Bosphorus. There was a map (much more detailed than the picture below!) accompanying the headsets, and we had much fun trying to identify the houses from the pictures…not always so easy. 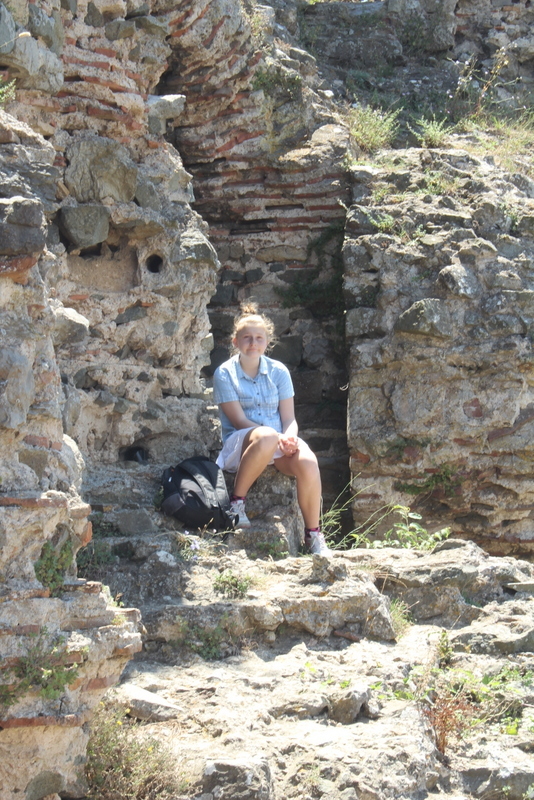 Sitting high on the hills overlooking Anadolu Kavağı and the Black Sea is the Yorus Fortress, built by the Byzantines in the same spot where Phoenician and Greek ruins from hundreds of years BC are being excavated today. It was the perfect position with views in all directions.We saw the fortress from the ferry and wanted to walk up, but I must admit we underestimated the climb quite a bit, but it was definitely worth it! 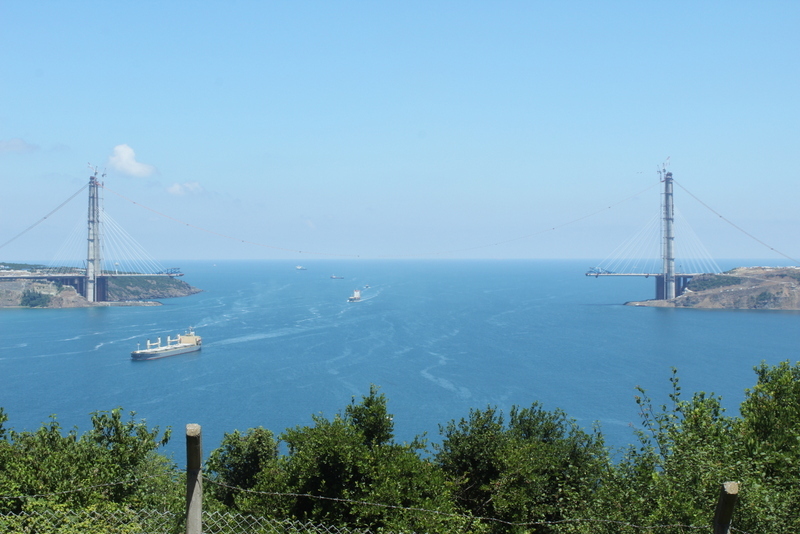 The views over the Black Sea were magnificent! Back at the harbour, we had a fantastic lunch of local produce and fish (of course). Quite a spread for lunch! After lunch, we made a move on the ferry as we wanted to have good seats on the way back. While we were waiting for the ferry to depart we enjoyed the views and scenes, including local afternoon activities! 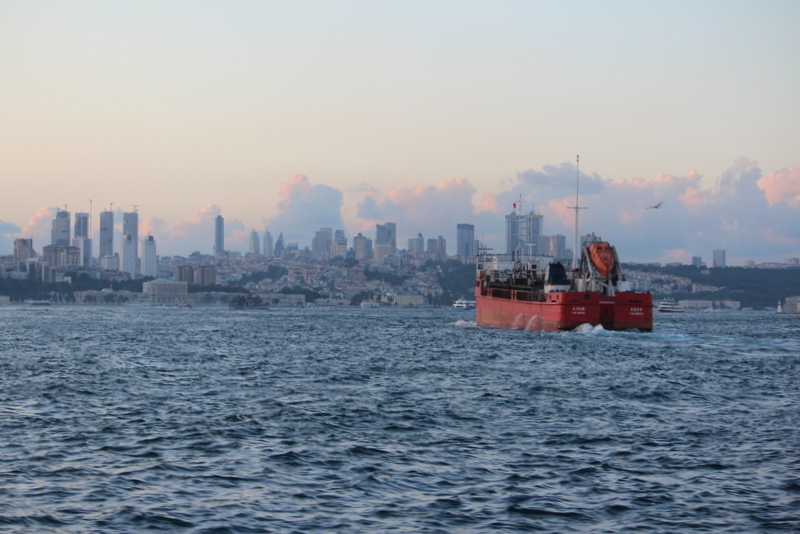 The return trip was relaxing and we had beautiful views over the European banks and even had a glimpse of the Dolmabahçe Palace. 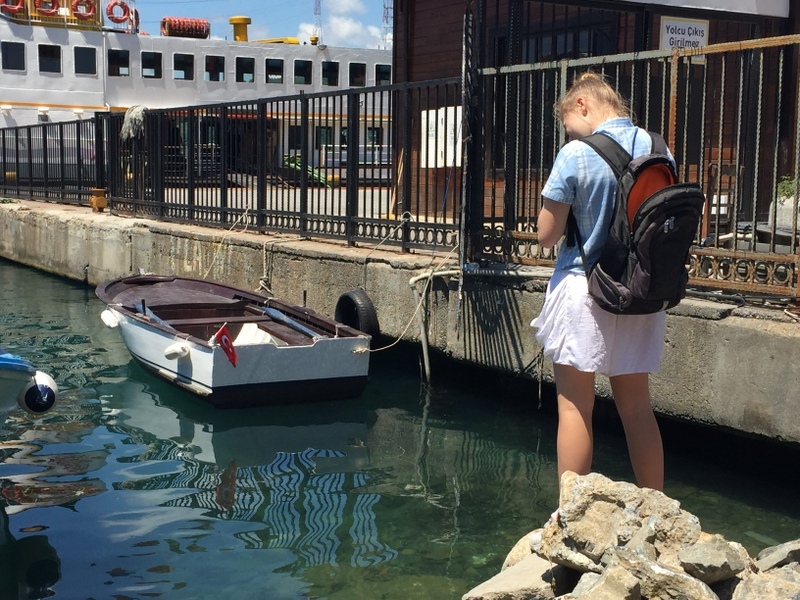 We disembarked at the Karaköy harbour and took the tram to Taksim Square, at the northern end of the most famous shopping street, İstiklal Caddesi, our next place to explore…We had a coffee at Starbucks, as you do with a teenager on tow, and set off to explore. 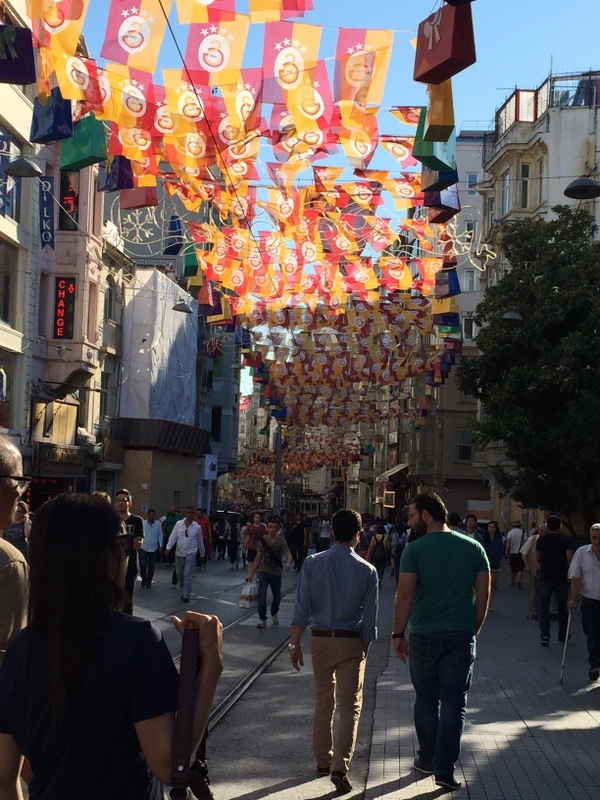 İstiklal is a pedestrian road and reminiscent of many European and British shopping streets with the likes of H&M and many other high street stores dotted with family owned Turkish shops. It was quite a sight. There is also a historical tram running down the street. 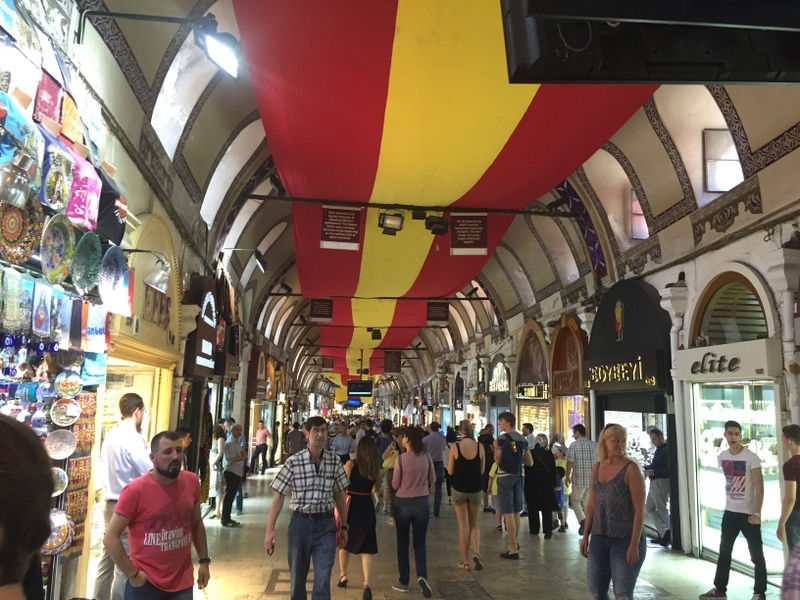 As this was almost the last day in Istanbul, we did a little bit of shopping, before we finally rested our tired feet at a local Kebab restaurant. Joining just as the locals were breaking their fast, we were astonished at the sizes of some of the feasts being consumed around us! After dinner, we walked the last bit to our apartment, and fell into bed exhausted! 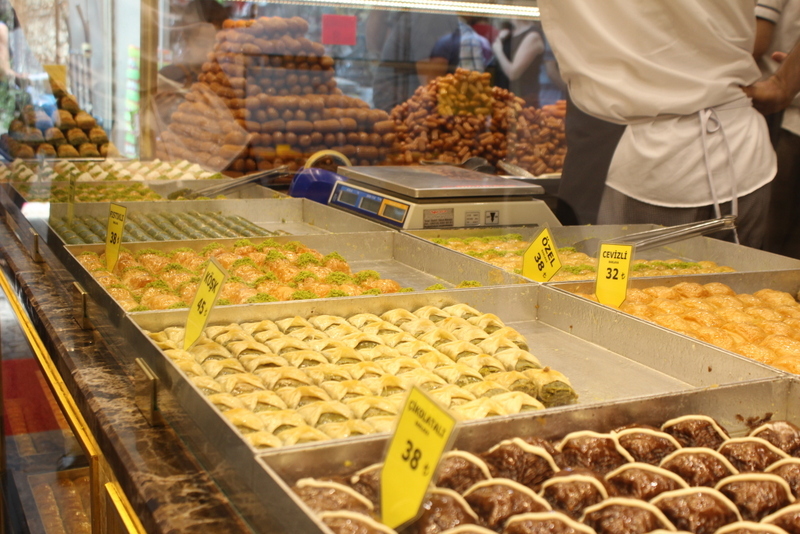 It was our last full day in Istanbul…and we could not believe it. 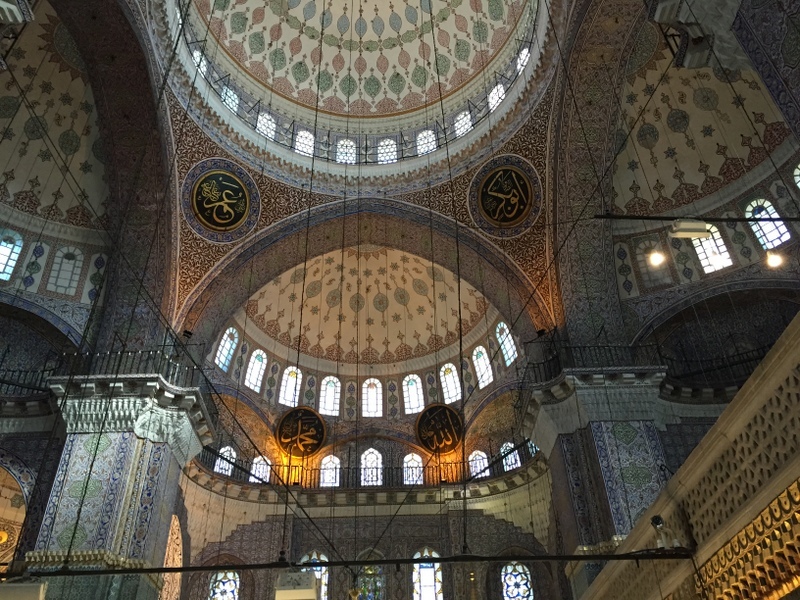 Our days in Istanbul were packed to the brim and we had seen and experienced so much, but we were not done yet, and we wanted to get the most out of our final day. Which meant we had a very full day planned, mainly shopping. Anya made lists of everyone we still needed to get gifts for and saved it on my iPad. 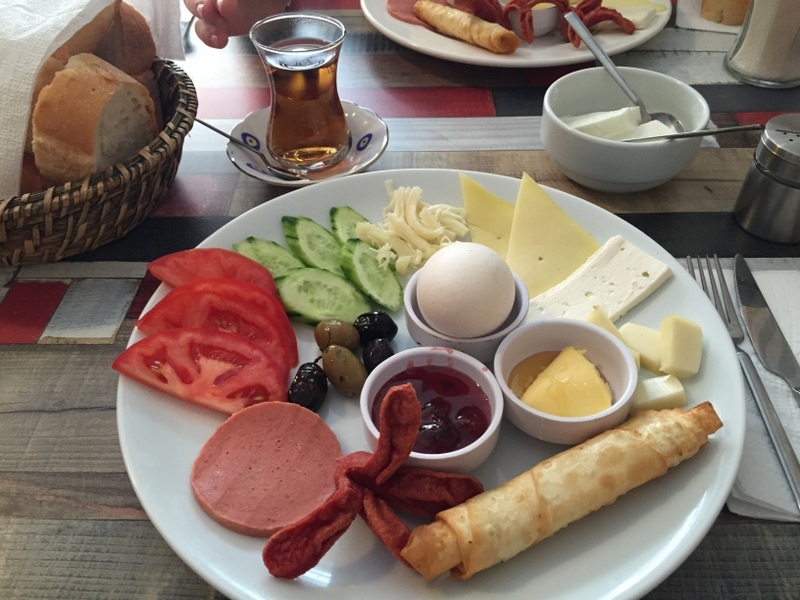 We had leftovers for breakfast and made our way to the Eminönü district. 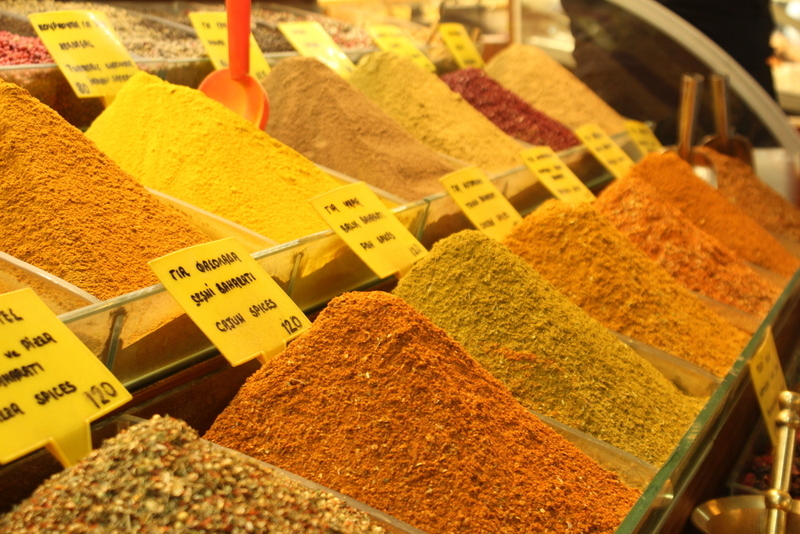 First stop the Spice Market! 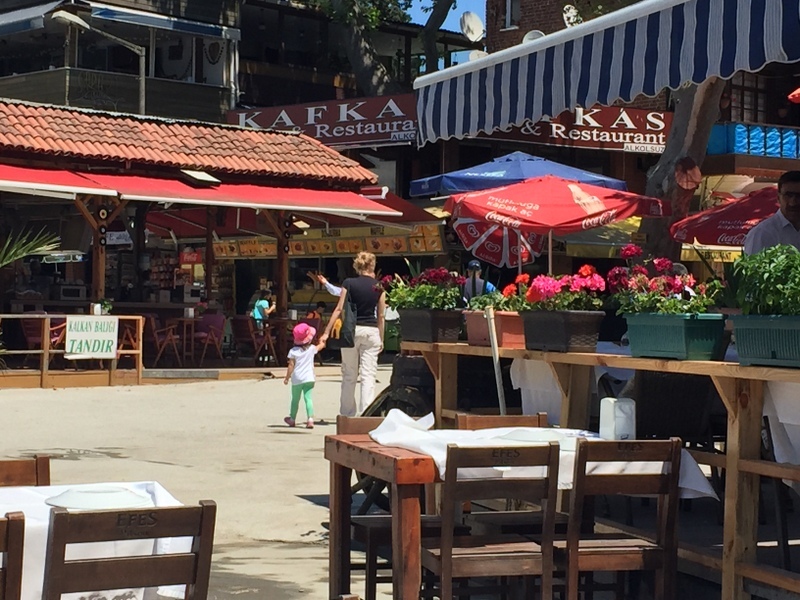 I bought spices and Anya bought some of her loved Apple tea, Then we made our way, as we did with Cammie on Tuesday, past the sweet shop, stopping for tulumba and onwards to Altan Sekerleme, for some sweets and Turkish delight. 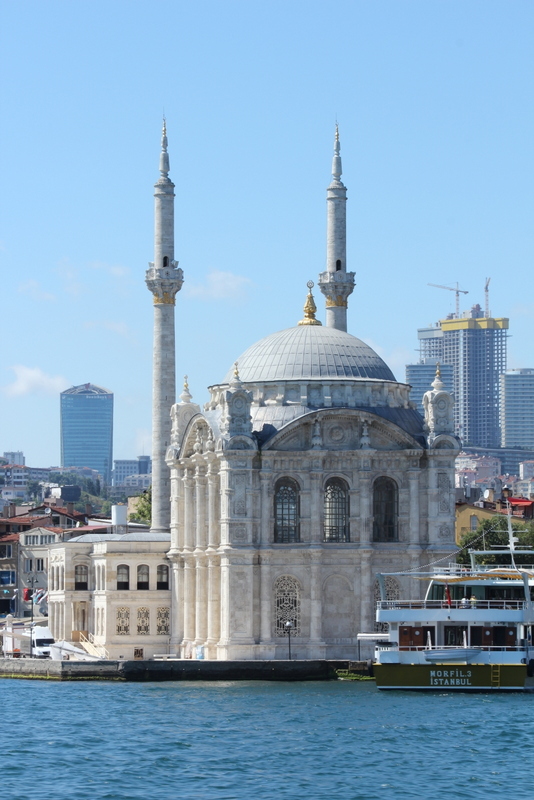 Our next stop was at the Yeni Cami or New Mosque where we met Cammie the first day. We were given cloaks to cover ourselves and entered. It was prayer time, and we traipsed around quietly while taking in the beauty. We made our way to the Suleymaniye area, because there were one other thing we definitely wanted to do and that was to visit a Turkish bath. And there was a Turkish bath in the Suleymaniye district, and we decided it would be the perfect stop after our next escapade, the Grand Bazaar! 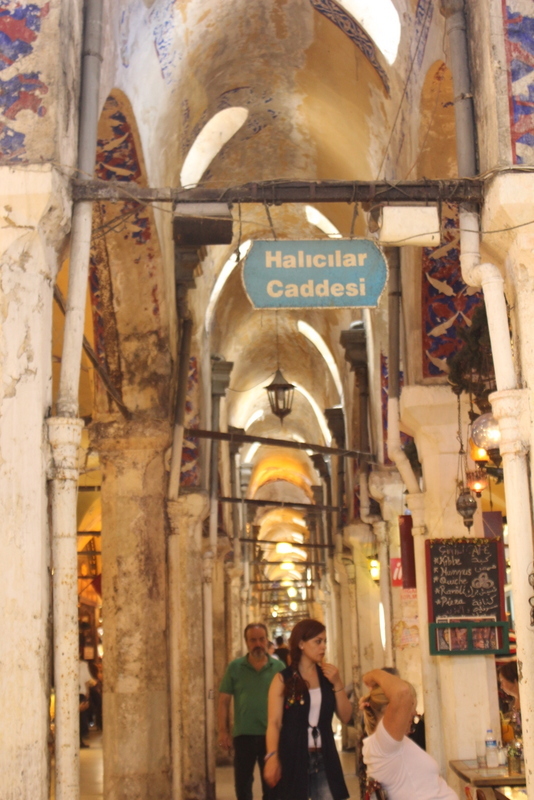 We made a reservation and went to the Grand Bazaar or Büyük Çarşı. 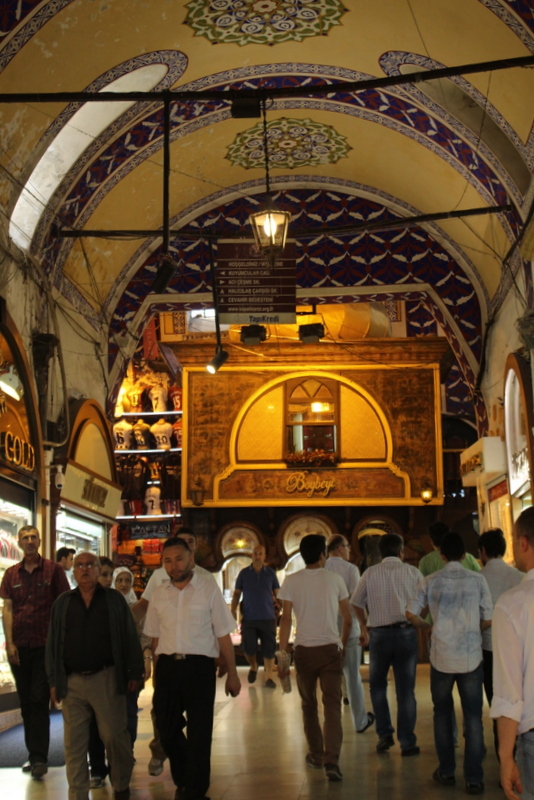 It is one of the largest and oldest covered markets in the world, with 61 covered streets, with construction started in 1455! And who says shopping is a new hobby?? Our bartering skills were tested at the bazaar and on more than a few occasions, we would walk away wondering whether you got a good deal or not, but it was a fantastic experience and we managed to spend a fair amount of Turkish Lira…! At the end of the day, we were exhausted and as we made our way to the Suleymaniye Hamam, we were looking forward to a pampering session! The Suleymaniye Hamam was commissioned by the Sultan Suleyman the Great and was built in 1557. 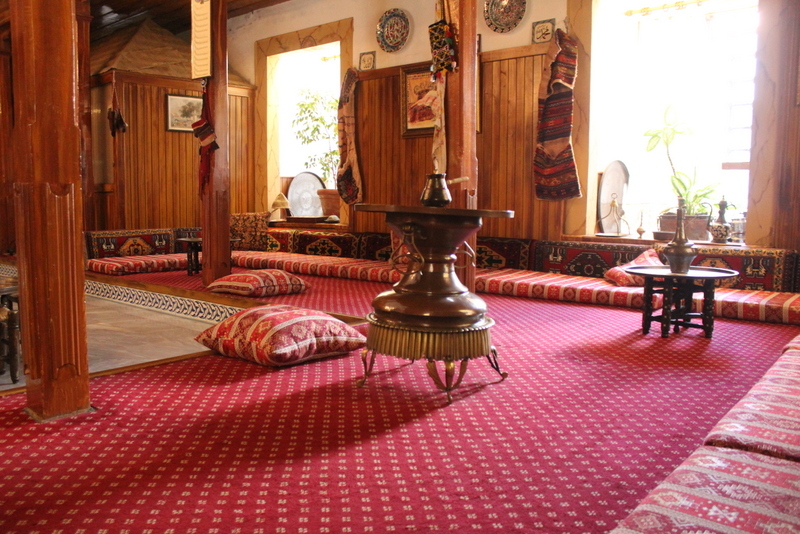 It is a small hamam and caters for families and couples as opposed to most of the hamams in the city that separates men and women. And pampering it was…As you enter the hamam, you are given a bikini set made from material and a Turkish towel, as well as wooden slippers. The routine starts off with a sauna session on a large slab in the centre of the domed hamam. 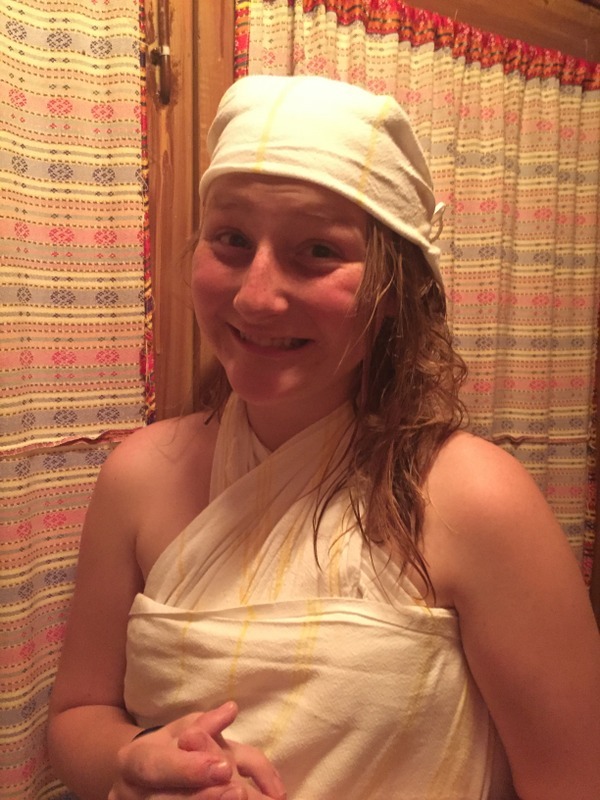 You then proceed to one of the rooms leading off from the sauna area where you are scrubbed and foamed from head to toe! They even wash your hair if you so wish. After the 15-20 minute scrubbing session, you are given dry towels to wrap yourself in and are led of to a small lounge, where you can order refreshments while you wait to dry completely. Of course, with all the shopping, and snacking all day long, both Anya and I had not eaten much during the day and it was already 16:00 by the time our hamam experience started, and we both got headaches from dehydration. I would definitely recommend making sure you are properly hydrated before going to a hamam! After getting dressed (there are even hairdryers), we relaxed for a while in the common loung area, before starting to make our way back to our apartment with all our shopping! I took a headache tablet on an empty stomach at the hamam, and this resulted in nausea, so I needed to lie down for a little bit. The lie down was fairly short though, because there was one more item on our list of things to do…dinner on the Asian side. 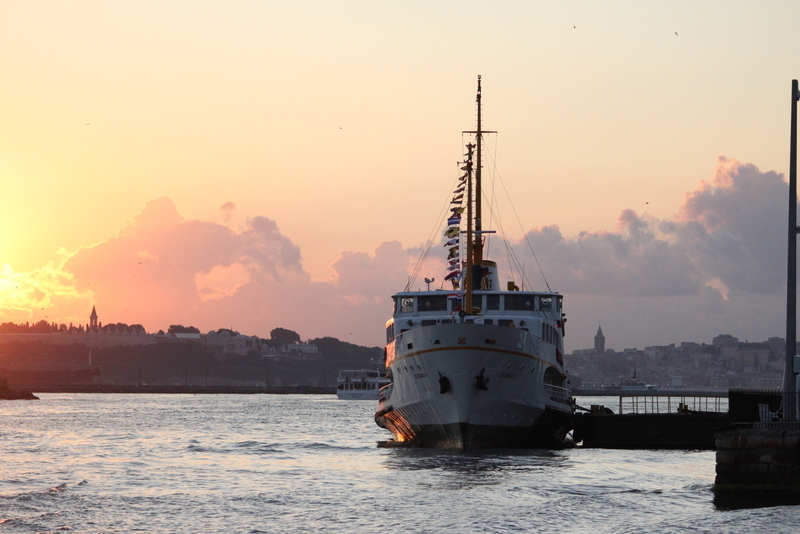 We made our way back to the Eminönü and caught another ferry to Kadıköy, on the Asian side of Istanbul. 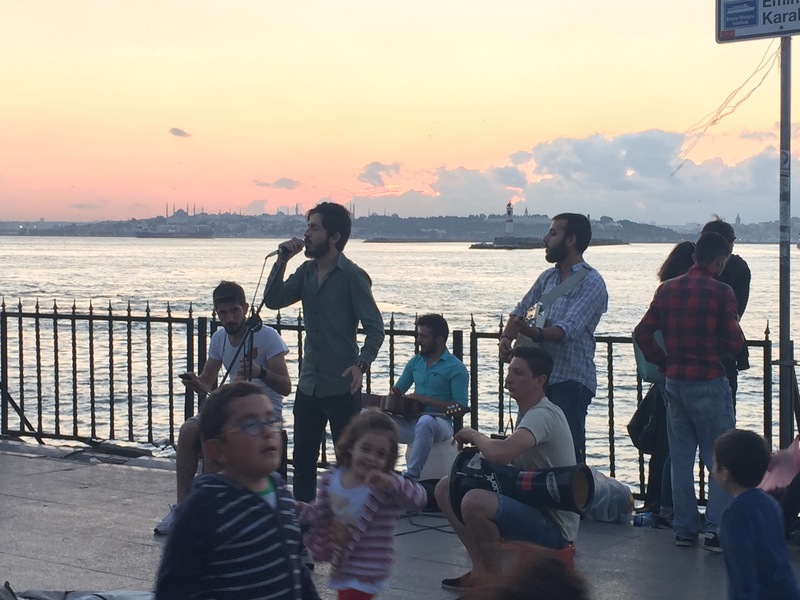 We made it to Kadıköy just in time to view our final sunset and what a sunset it was! The view of the Hagia Sophia from a completely different continent was mind blowing. There was an live band playing music and people walking around in traditional clothes. 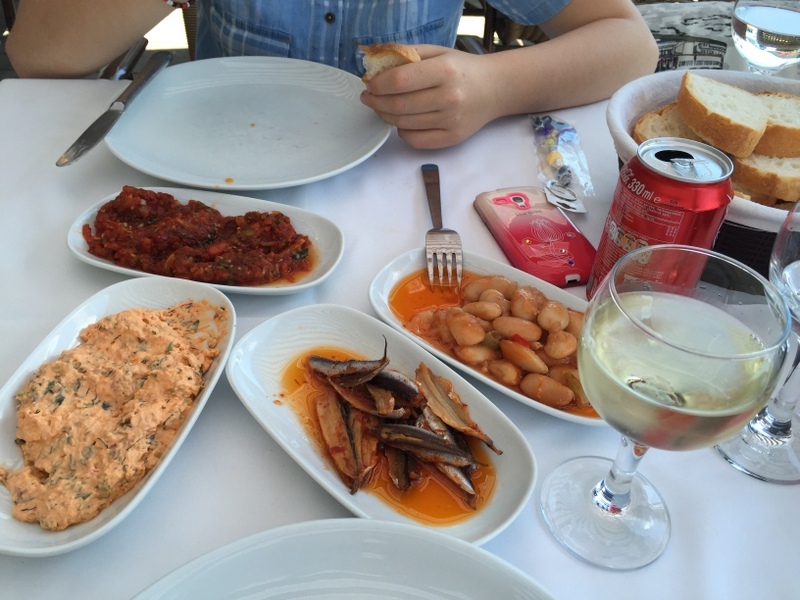 We made our way to the Ciya Sofrasi restaurant, another recommendation from Cammie. As they were not allowing English menus during Ramadan, it was a bit of a confusing effort to order dinner, but we managed eventually and had a good meal. As we made our way back to the apartment, knowing that we didn’t have much time for anything other than packing the next day, we had mixed feelings. We wished that we had a few more days in Istanbul or even enough time to go and see a bit more of Turkey, but also looking forward to sleeping in our own beds again. 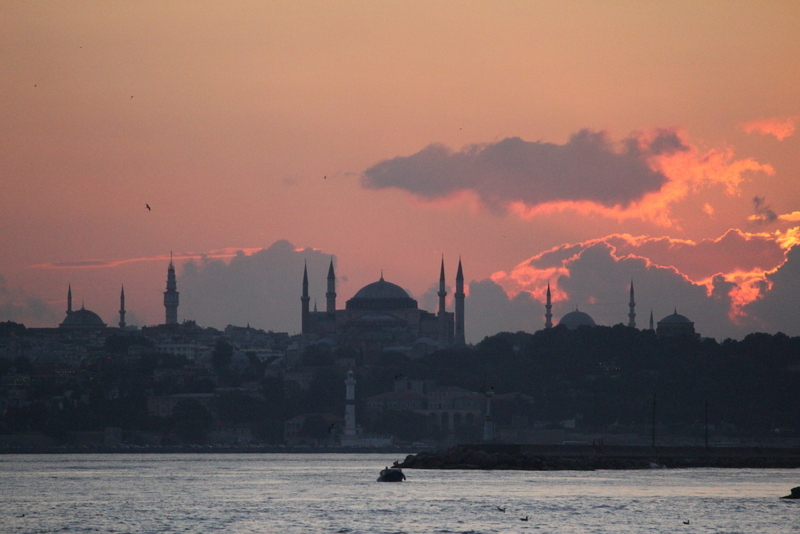 Istanbul was an experience that transcended anything that I was expecting. The indisputable place where east and west meet, in the architecture, the food and the people. I would love to go back one day and spend more time in this city with new experiences around each corner. And maybe venture into the rest of the country.